At each AIA Annual Meeting, there is a single session that includes all poster presentations. This session is generally assigned a four-hour time period (e.g., 11 AM–3 PM) on the first day of the meetings. The presenter or, in the case of multiple presenters, one of the presenters is stationed at the presentation during the session. 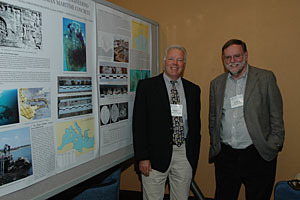 Presenters are provided with a 4 × 8 foot space to display their materials.The PAMC regards poster presentations as a particularly effective way to present complex graphic and/or quantitative data. Beginning in 2005, awards were given to the best posters: the first is awarded to the presentation judged “best poster” by a panel of three judges appointed by the Program Committee; the second is presented to the poster judged “first runner-up” by the panel of judges; and the third and fourth awards are presented to the posters deemed “Best poster designed entirely by a student or students" for undergraduate and graduates. 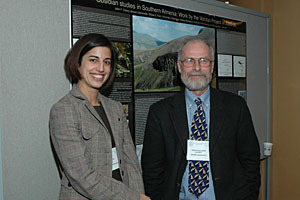 Graduate and undergraduate student posters are also eligible in the best poster and first runner up categories. Dating Roman Mortar and Concrete with Radiocarbon Analysis: John R. Hale, University of Louisville, Åsa Ringbom, Åbo Akademi University, Jan Heinemeier, Aarhus University, Alf Lindroos, Åbo Akademi University, Lynne Lancaster, Ohio University, and Fiona Brock, Oxford University. Rapid Cooling Effects in Copper Smelting Slags from Chrysokamino: Miriam G. Clinton, University of Pennsylvania, Shannon Martino, University of Pennsylvania, George H. Myer and Dennis O. Terry, Jr., Temple University; and Philip P. Betancourt, Temple University. The People's Choice awards have been discontinued. Runner Up Painters on Pots? **Please note that prior to 2005 only the Best Poster Award was given.